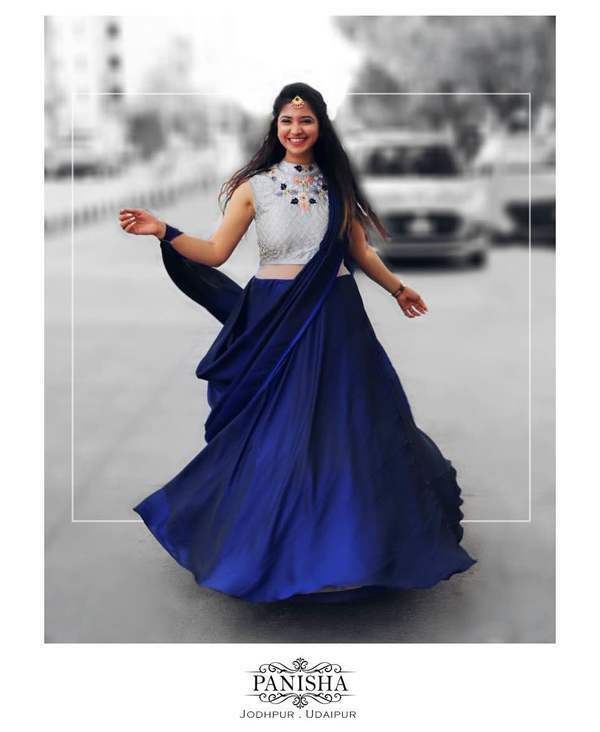 A blue ready to drape saree with mesmerizing handemade blouse made with a combination of sequins and zardozi framing the neck, it is embellished with sparkling stone work and the drape is made of silky lycra. PANISHA JODHPUR AND UDAIPUR NOW LOADED WITH FRESH AND NEW DESIGNER ETHNIC TRADITIONAL HANDCRAFTED HANDMADE PURE FABRIC ATTIRE. Material:silk , Crepe and Lycra Work: Zardzozi, Cutdana, Sequins and Stonework Color: Blue NOTE: The product is a ready made saree. DELIVERY TIME; will be around 3-5 working days for METROS & TIER 1 cities, and approx. 5-7 working days for TIER 2/3 cities.